You built a wealth which you wish to protect, but you also wish to take advantage of opportunities to assure its growth, with the aim of improving your current and future financial situation. You realise that the world moves ceaselessly and that the commercial and financial flows are more and more complex, that the fiscal and legal regulations are in continual evolution. You are very commited in your professional and private life, and the speed of communications seems to test your constraints, while you thought that they were going to help you. You visit a close friend, your banker as well as your insurer. These initiatives will take time and your advisers will bring you several ideas, sometimes totally different ideas, and you will not be certain of which ones to choose. Fortunately, there is another way today of proceeding. LGH is a company totally independent from any financial institution. The management of your wealth according to LGH does not amount to the performance of a portfolio over one year or to the conclusion of a life insurance. It is the methodology which integrates your profile, whatever is your fortune, in a will of global and coherent management of your assets, which we can summarise through diverse key stages. * Our solutions as well as our products, allow you to benefit from our structure while keeping your relations with your bank or any other providers. By exchanging ideas, listening to your concerns and popularising the diverse problems which you have to face (sometimes complicated by certain companies to value their products), we clarify the individual needs to allow you to understand clearly the stakes in order to apply the best strategic choices. We present you with the results of the various analyses prepared/done by our specialists and help you to validate your choices.Our solutions as well as our products, allow you to benefit from our structure while maintaining your relationships with your bank or any other providers.You benefit from a transparent pricing, from budgeted services, of directly negotiated fees by LGH FS with his business providers. After validation, we set up one or several various solutions. Together we fix deadlines for each of our objectives to improve the follow-up. We do not limit ourselves only to our mandate, but consider your entire wealth portfolio during our assessments. This approach gives us a holistic overview. If for example, you mandate us to manage a securities' portfolio, we define together its importance, its function. Is it a simple reserve of liquid assets or does it represent a dominant portion of your total wealth?Such a holistic perspective allows us to control the overall risk within your asset portfolio. Furthermore, it leads naturally to many other considerations, in particular fiscal and inheritance, generating performance without risk. 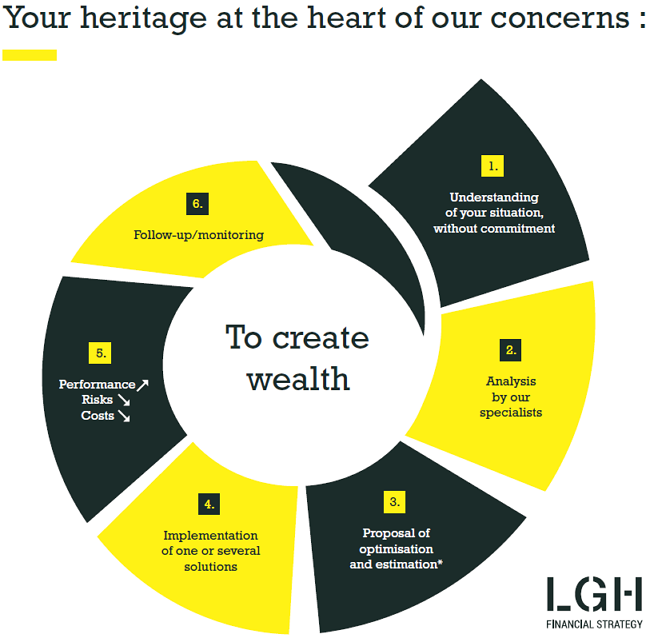 Your overall wealth evolves throughout your lifetime, influenced positively or negatively by your diverse private or professional situations, but also by the modifications of the laws as well as the markets.We (LGH and our partners) have the expertise and the overview. As soon as an opportunity appears, we inform you!It is regrettable to act only during or after your meetings with your advisors.The follow-up of your affairs and the monitoring of your assets allows you to anticipate and to make the good decisions, which will allow you, to create sustainable wealth.